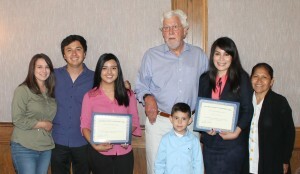 Marion Sumimoto from the Historical Society of Monterey Park welcomed the students with their family members, club members and John Scudder to the Annual Scudder Scholarship Awards Luncheon held on June 17th at the Monterey Hill Restaurant. She thanked the Scudder Family Trust for their generous scholarship donations to students studying in nursing, business and the legal professions. She also thanked the Scholarship Committee: Alice Nishimoto, Dolores Seidman, Gloria Guerrero and Pauline Lemire for their services. 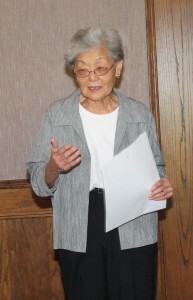 She also introduced current and former Boardmembers Jan Sokhom and Beryl Williams to the guests. John Scudder, grandson of Laura Scudder, the famous Potato Chip Queen, was happy to attend this very special event in honor of his grandmother. He is in the process of publishing a book on her life history complete with pictures and her famous quotes. He and his brothers are very honored to keep their grandmother’s legacy alive for the future generations. She was a nurse, business owner and a lawyer who worked very hard to support her family and her employees. She loved her country, her family and her employees. He thanked the committee and the Historical Society for their keeping this 25-year tradition alive. 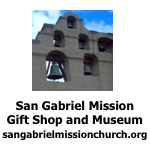 His book, when published, will be available to view at the Monterey Park Bruggemeyer Library and the Historical Society. 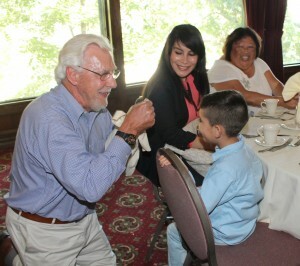 John Scudder performed two magic tricks for five-year-old Daryan, son of Maria Michell. His face light up with the magic coin trick and the magic bunny trick. 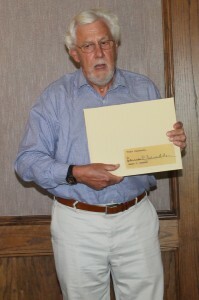 John Scudder presented a scholarship check to Maria Michell. She is beginning her studies at Cal State Los Angeles to become a Counselor to help young mothers and a business major. Maria Michell thanked John Scudder and the Historical Society for this money. It will help her with her education to be come a Counselor. She thanked God and everyone for this scholarship. 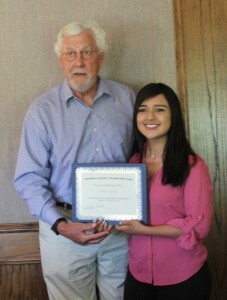 John Scudder presented a scholarship check to Karen Tellez. She is beginning her studies at East Los Angeles College to become a Registered Nurse. 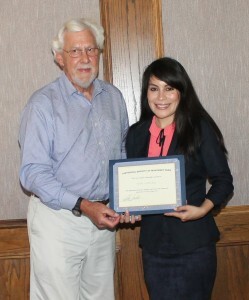 Karen Tellez was very happy to receive this scholarship. It will be very helpful to her. She will be very busy working on her major. She thanked Mr. Scudder and the Historical Society for these funds. John Scudder, Maria Michell, her mother also named Maria, and her son, Daryan and Karen Tellez, her brother, Javier and his girlfriend, Maria joined in a group picture in honor of the Scudder Family Trust. 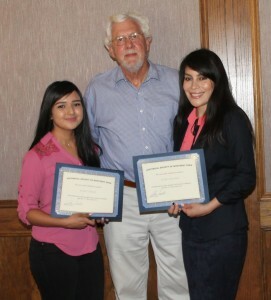 Congratulations to Maria Michell and Karen Tellez for being the latest Scudder Scholarship winners!